The brows may be lifted and shaped by injectable treatments. The medial (middle part of the) brows may be lifted by injecting the procerus muscle and parts of the glabella area. Dermal filler injections to reshape and lift the brow. As we age, our eyebrows lose projection and height, the bone and soft tissue dissolves, leaving us with reduced structural support in that area. It is easy to replace the support in the brows with dermal filler. Dermal filler may be injected into the outer brow itself to give more projection to that area. Dermal filler can improve the height of the brows, the aging of the brows and the shape of the brows. Dermal filler can be used to improve the appearance of prominent brow ridges, to widen the eyebrows and to reverse the aging appearance in the face region around the eyebrows. Is it the inside brow height or the outer brow height bothering the patient? Does the patient have a certain eyebrow look in mind? eg a more feminine look, a flared eyebrow with a raise on the outer edge or a more flat, masculine type brow.Does the patient want the outer brow area or the inner brow area lifted? Does the patient want a more natural appearance, or do they want the maximal effect possible? Where the brows sit currently, what shape they are. Whether there is any eyelid droop or asymmetry. Whether the temples/ forehead need filling. How much projection the brow has lost. Ice is always used to decrease pain and to reduce the risk of bruising.Nitrous oxide (happy gas) is available for use with cosmetic injectables.Very rarely patients will use Penthrox for brow lifting injections. The “ouchless needle” can be ordered. If the patient requires a skin booster or a dermal filler, local anaesthetic may be injected first. 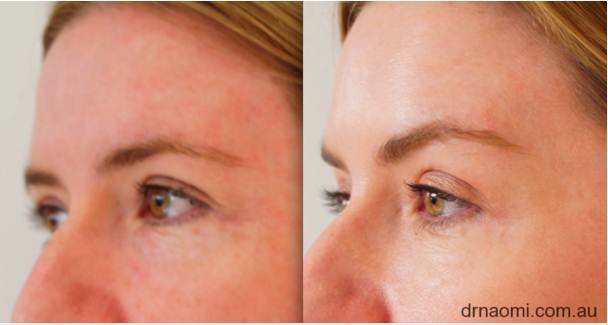 What happens during the brow lift treatment itself? The face will be cleaned with alcohol. Ice will be applied to the area briefly before treatment. The doctor will inject around the eyes and brows, with muscle relaxing injections: commonly injecting in the muscles which pull the eyebrows down eg orbicularis oculi and procerus. Then pressure with gauze will be applied.With dermal filler, the place to inject will depend on the anatomy of the brows currently. The outer brow may be injected or the inner brow where it meets the root of the nose may be injected. The procedure itself takes less than 5 minutes. Sometimes there can be redness, small lumps, which can look like mild acne and usually resolve quite quickly. Asymmetry: One side may be better treated than the other, this is usually because the patient is asymmetrical to start with. Eyelid droop is a possible risk with browlifting treatment. It is very uncommon and in our practice below 0.5% over the last decade which is much lower than the stated rate. * Bruising occurs in a significant number of cases. * Asymmetry: Sometimes one side is better treated than the other, this is usually because the patient is asymmetrical to start with. * Infection is a very rare complication, but always a possibility when the needle goes into the skin. * Need for further treatment: Often with lips, it will take several syringes of product to get to where the patient wants to be. Who is unsuitable for treatment for injectable brow lifting? There are some patients who will be unsuitable for muscle relaxing injections:. The closer a patient’s brows are to their orbital rim (the bone you can feel above your eyes, then the higher the risk of lid droop from this procedure). What to expect after muscle relaxing injectable brow lifting? The effects will not start to occur for 2-8 days. What if I get asymmetry at some time before the 4 week point? Do I call the doctor? Do I call the doctor if I get eyelid droop? What do I do if at 4 weeks post treatment if I want the brows even higher? When should I have my next treatment for brow lifting? muscle relaxants at 3 months. Price for muscle relaxing injections for browlifting?